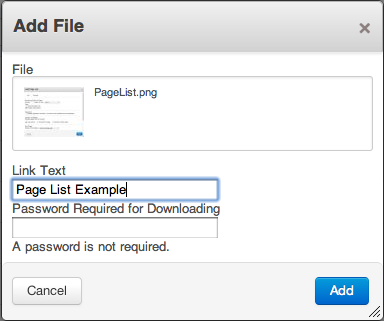 The file block makes it easy for you to link users to a downloadable file. File - pick the file from the file manager, which lets you upload one as well. Link Text - display this copy instead of the file name. Whatever copy is here will be hyperlinked with the download. Password Required - This sidesteps the built in permissions of concrete5 and just lets you set a quickie password required before downloading the file. Note: File statistics from the File Manager track who has downloaded your files and when. You can access these statistics through the Dashboard.